Shop our signed Valtteri Bottas F1 memorabilia including autographs on mounted photographs and many other Formula one related items. Signed Valtteri Bottas shirts, photos, caps & visors. All with fast worldwide shipping, Certificate of Authenticity and free UK delivery, many have photographic proof! Finnish racing driver Valtteri Bottas is a rising star of Formula One – enjoying success in his career to date, with a promise of grand slam wins in years to come. He has never won a Formula One Championship but finished third in 2017. Bottas has been a regular fixture in the Williams-Renault and Mercedes teams, partnering with high-profile team-mates including Felipe Massa and Lewis Hamilton. Bottas is known for his cool, calm and collected personality. This unflappable demeanour has served him well on the racetrack – but when he isn’t competing he has a playful and mischievous streak. He’s also known for his love of saunas and ice baths – taking regular dips in freezing cold lakes in his native Finland. His wife is also a sporting legend in Finland – Olympic swimmer Emilia Pikkarainen. You’ll find a fantastic selection of Valtteri Bottas signed F1 memorabilia here at Firma Stella. 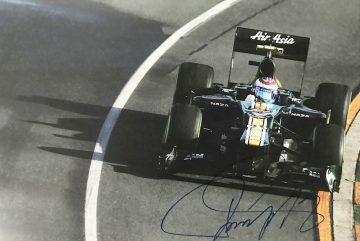 Here you’ll find a variety of items autographed by the Formula One star, including signed caps, visors, clothing and photographs. Relive some of the riskiest races or commemorate your favourite competitions and championship triumphs. Each item is supplied with a certificate of authenticity for you to keep.